L.A. – the lost tapes (Somewhere between the MAK-center and Beverly Blvd. Within the context of the MAK-Schindler-grant I stayed in Los Angeles for seven months in the year 2011. 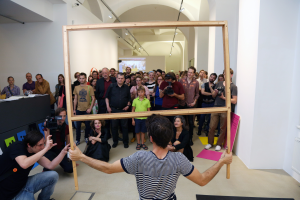 There was another scholarship holder named Florian Schafschetzy, an architect and also from Vienna. 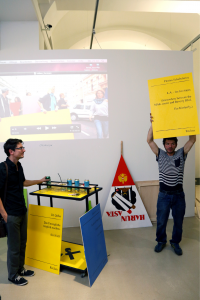 At the end of the studio residency we exhibited our projects in the MAK-centre. One part of my project consisted of a yellow fountain which was studded with mosaics. Until the 1970s the “Dodge house” was located right next to the MAK-centre; planned by the architect Irving Gill in 1916, it was the prototype of the Californian, reductionistic modernism. Unfortunately it had been pulled down by a speculator in real estate in the year 1977. After the exhibition was over I had a problem with the “disposal” of this sculpture. The MAK-centre didn’t want to take care of it, and also no potential buyers could be found. Fortunately I had mounted rollers onto it, and Florian Schafschetzy and I decided to generate a new work out of the disposal. So, in a nightly action, I slid the fountain with the greatest of efforts several kilometres uphill to the Beverly Blvd. Florian filmed and gave stage directions, defined the dramaturgic process. On the Beverly Blvd. stood a fountain on the corner of a crossroads, in which the one I had built fitted exactly. In this way we extended the already existing fountain. Here we are dealing with a functional and formal “doubling” again – but now related to the future. We stored the video footage at my external hard disc drive. Unfortunately I lost it on my way home to Vienna in New York. We were disappointed, Florian was furious. Florian thought that the only remaining possibility to save it would be the “re-narration” of the video, of the storyline. So I invited Florian to my performance in order to “retell” our video. I confined myself to design only the context, the “display” for Florian’s narration. 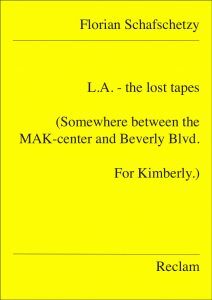 L.A. – the lost tapes (Somewhere between theMAK-center and Beverly Blvd. Im Rahmen des MAK-Schindlerstipendiums hielt ich mich 2011 für 7 Monate in Los Angeles auf. Unter den weiteren Stipendiaten war auch Florian Schafschetzy, ein Architekt, ebenfalls aus Wien. 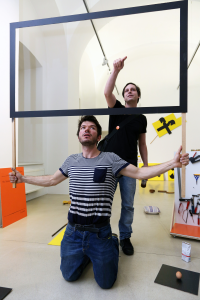 Am Ende des Stipendienaufenthalts stellten wir unsere Projekte im MAK-center aus. Ein Teil meines Projektes bestand aus einem gelben mosaikbesetzten Brunnen. Gleich in der Nähe des MAK-centers stand bis in die 1970er das „Dodge house“, 1916 vom Architekten Irving Gill geplant, war es der Prototyp der kalifornischen, reduktionistischen Moderne. Leider wurde es 1977 durch einen Immobilienspekulanten abgetragen. Mosaiksteinen arbesk besetzter Brunnen. Diesen versuchte durch den Bau meines Brunnens zu „rematerialisieren“. handelte sich erneut um eine funktionale sowie formale „Verdoppelung“ – nun allerdings in die Zukunft gerichtet. Wir speicherten das Videomaterial auf meiner externen Festplatte. Diese verlor ich jedoch leider auf meiner Heimreise nach Wien in New York. Wir waren enttäuscht, Florian war erbost. Florian meinte, die einzige Möglichkeit, die uns jetzt noch bliebe – wäre die „Nacherzählung“ des Videos, der Handlung. Also lud ich Florian zu meiner Performance ein, um unser Video „wiederzuerzählen“. Ich beschränkte mich darauf, für Florians‘ Erzählung nur den Kontext, das „Display“ zu gestalten.